Rostock, April 2018 – The ship crane department of Liebherr maritime cranes has sold the first two units of the new floating crane model CBG 360 to the Russian foodstuffs and ingredients producer Aston. The latest four rope grab crane development of Liebherr ´s floating crane segment is going to be installed on a converted handymax bulk carrier (45,000 DWT) with a total length of 185 m and a breadth of 30.5 m. The ship will be retrofitted with the two Liebherr bulk handling cranes at the Turkish shipyard Kuzey Star Shipyard Tuzla / Istanbul. After completion of the conversion in early 2019, the ship will be used as a transshipment solution for grain handling in the Black Sea and the Sea of Azov. Many years of experience from the operation of the CBG series have been put into the development of the new CBG 360. The ordered cranes are designed for high speed bulk handling and will be installed on 10 m eccentric platforms in order to increase the maximum outreach up to 36 m. The maximum lifting capacity of the high-performance CBG 360 ´s is 36 tons. Larger and additionally strengthened pulleys ensure increased service life of the ropes and reduction in abrasion. The specially developed high performance winches are designed for continuous operation and ensure constant and reliable performance with full load. 2006/42/EC and is therefore CE certified. That means, the CBG 360 can operate in every European country. Improved access to all crane components is ensured thanks to new additional maintenance platforms on the slewing column and boom providing optimum maintenance conditions. As in all cranes of the CBG series, the most important hydraulic and mechanical parts are positioned in a dustproof machine house making the CBG 360 particularly resistant against diverse weather conditions. Liebherr Maritime Cranes and Aston are looking forward to a promising business relationship. 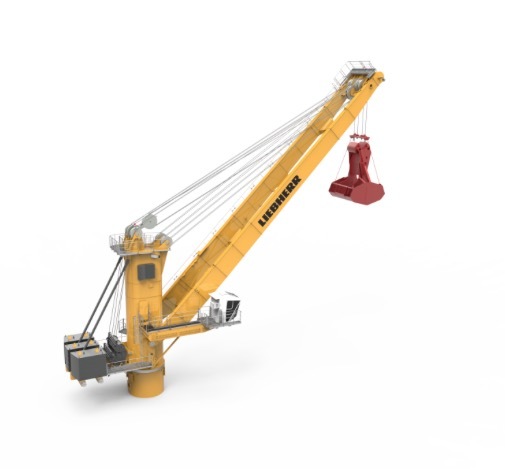 In the last 15 months, the Russian group ordered a total of 10 Liebherr crane products from the current crane portfolio for their floating business. Since December 2016, Aston ordered three ship sets of two units Liebherr CBG 300 each as well as another ship set of two units Liebherr CBG 350. All ten floating cranes are equipped with additional 10 m eccentric platforms to optimise the outreach of the complete installation. Both companies benefit from expertise within their core competencies.